These cookies are a “must bake” for me every holiday season. This year was no exception, although I made them very late – right before New Year’s Eve. But then I heard on this radio spot about lucky New Year food traditions that some eat these for good luck on New Year’s Day thinking that the cookies are coin-like to represent money. Although I heard this after New Year’s Day, I was glad to have eaten them as part of our lucky New Year’s Day menu! These cookies are called many different names – Mexican Wedding Cakes, Russian Tea Cakes, Snowballs, Butter Balls and others. I’ve made a version of them for years from a recipe that was purportedly the one that Jackie Kennedy used which used powdered sugar as the dough sweetener. Whenever I would tell my Mom (aka Granny) that I’d made these cookies, she’d ask “Did you make Grandma Teegarden’s (my Dad’s Mom) recipe – the one with honey?” I would confess each year that I did not, having been enamored at a young age by Jackie Kennedy. Last Christmas, I made both recipes and conducted taste tests, asking friends to say which they liked best. The votes, including mine, were in overwhelming favor of Grandma T’s, so I think I have dumped Jackie O in favor of Grandma forever! I almost never make these cookies for Christmas because everyone else in my family does! But this year I had a girls’ cookie baking get-together at my house, and my friend Jen wanted to make the Joy of Cooking version of these (which is exactly like the Jackie Kennedy recipe), and I swayed her to Grandma’s recipe instead. They turned out perfectly, as usual! This is definitely my favorite version of this recipe, and the times I have made them, this is the one I use. It was actually one of the first recipes ever given to me (by my dad), when I was in grade school and first learning to bake! Cream the butter, salt and vanilla with a electric mixer. Add the honey and the flour and continue to beat on medium until thoroughly blended. This will be a fairly stiff dough. Stir in the nuts by hand. 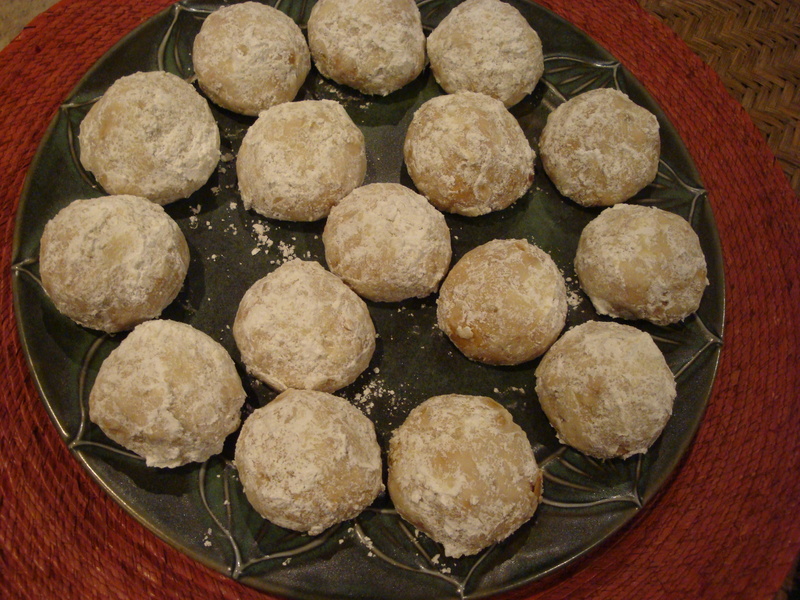 Pinch off small amounts of dough and roll by hand into balls the size of walnuts. Place on an ungreased cookie sheet and bake at 325 degrees for 20-30 minutes until the cookies are just starting to turn golden brown in spots. Place the cookie sheet on a rack and let sit for a few minutes to set. Place the powdered sugar in a pie plate or round cake pan. Roll the cookies in the powdered sugar while cookies are still warm. (Make sure you let them set or they can fall apart if too hot.) You can roll them in powdered sugar again after a couple of minutes. *A note on the pecans: This year I bought a bag of toasted pecan pieces from Trader Joe’s and used those. I had never used toasted pecans before in this recipe and they made a delicious cookie even better – toasted pecans are the way to go! The pecans need to be chopped or ground fairly finely, but be careful not to overdo it or they will become powdery or oily which will not result in a good cookie. These low-tech vintage nut grinders are perfect for the job and, I just discovered, available on eBay from $3 to $20. The one I use is on the left. I’d say your cookies look delish! …and the vintage nut-grinder tip is appreciated. I made these today and they are delicious–loved adding honey! I’m glad you enjoyed these, JoAnn! I’m making them myself today (Aunt Suzy) and I think my blog partner, Margaux, made them yesterday. A family tradition.